Real Madrid set their asking price for Gareth Bale with Premier League clubs interested plus other transfer rumours. Paul Pogba has been linked with a move to Real and Manchester United could ask for Bale or Toni Kroos in ay potential deal. 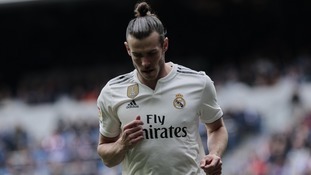 Gareth Bale's agent has suggested Real Madrid supporters should be "ashamed of themselves" for jeering the Wales international. Get your fix of all the best La Liga action from last week, including a dubious Real Madrid penalty and Barcelona blowing away Sevilla. Santiago Solari has insisted Gareth Bale was 'ecstatic' to score Real Madrid winner despite muted celebrations. Gareth Bale came off the bench to rescue Real Madrid with a calmly taken second-half penalty. Gareth Bale was named in the Wales squad for their Nations League group decider against Denmark after missing last month's international action. The Real Madrid forward missed the high-profile friendly defeat to Spain and the Nations League victory against the Republic of Ireland in Dublin through muscle fatigue. But Bale has featured in Real's four games since the last international break and he is part of Ryan Giggs' 26-man squad for the Denmark tie on November 16 and the away friendly with Albania four days later. Arsenal midfielder Aaron Ramsey and Chelsea youngster Ethan Ampadu are also back after missing the Ireland game.